Fabrics are subject to dyelot variations, and color cannot be guaranteed. Additionally, fabric colors can appear different depending on your computer monitor and settings. The actual fabric for your aisle runner may not be the same as the color you see on your computer, and it may also be different from the swatch you may have received. Fabric widths can vary between dyelots. 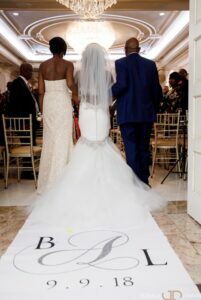 The actual fabric used for your aisle runner may be a bit wider or narrower than indicated. A 50% deposit is required to start the order process. Payments can be made by credit card, check, paypal or money order. When your order is complete, you will receive a photo of it, and the runner will ship upon receipt of your final payment. Of course, you may also pay in one complete payment if that is easier (it also expedites shipment of the completed product). Due to the custom nature of these items, no returns or exchanges are possible. All items are custom made just for you. Cancellations are only possible before you submit your final approval of your order and proof. In this case, you will receive a partial refund on your deposit to cover our time in creating the designs and proof. All items are custom made just for you. Normal production time is approximately 8-10 weeks to complete your custom order. This may vary at different times of the year depending on the work involved in your particular design and the volume of orders in house at the time that the order is received. Please keep this in mind when ordering at peak wedding season. We do accept rush orders when possible to fill them, so please inquire. Additional fees may apply. Please make yourself aware of conditions at the ceremony site (including steps, surface, etc) and use the best method for your needs. Knowing the actual length of the aisle ensures a perfect fit and correct placement of the design. SIMPLY UNROLL - In most cases, our SAFETY GRIP runner will not need any tape to stay in place. You will simply need to unroll it and the foam backing will "grip" the surface to keep it flat and smooth and it will not move around. Please note however, that weather and wind conditions (perhaps for an oceanfront ceremony) may require this type of runner to be taped. SAFETY GRIP runners are strongly recommended for use on slippery surfaces like polished wood, tile, marble , etc. It is also strongly recommended that all runners are put in place before the ceremony with the other decorations for the space. This gives the runner a chance to "settle" after being rolled up for a while and will also give your installer a chance to make any adjustments if necessary. If you are having an outdoor ceremony, please prepare yourself in case of high winds and other weather events. If you do experience high winds, the runners may need extra effort to secure in place. This is true for all runner types. Some clients have built special platforms (cardboard, plywood, bamboo, reeds, astro turf, etc) so that there is something to secure the runner to that will keep it from blowing in the wind. 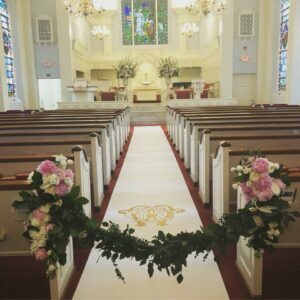 Starry Night Design Studio, Inc. does not accept responsibility for any bodily injury or property injury, damage or problem resulting from misuse or improper installation of your aisle runner. By placing your order, you release Starry Night Design Studio, Inc. and all persons associated with it from any liability, and you assume full responsibility.